The average 1 percenter is quite rich. But she lives in a state of relative poverty compared to the astronomical wealth of "the 1 percent of the 1 percent." Simple, right? Except this graph doesn't tell that story, at all. Because you see that languishing green line at the bottom? That's the 1 percent. Now let's add labels (the income data lives here if you wanna play at home) and voila, you can see this isn't a picture of the rich and the rest. It's the 40-year history of the rich, the truly rich, and the truly filthy stinking rich—the 1 percent, the 0.1 percent, and the 0.01 percent. Who even are these people—the 1 percent of the 1 percent? As Tim Noah explained, they're mostly executives and bankers. A 2010 study of the top 0.1 percent found that 61 percent of this group is either a banker or an executive/manager another big corporation. The rest are mostly lawyers (7 percent), doctors (6 percent), and real estate people (4 percent). How'd they all get so rich? It wasn't the way the rest of us get rich. It wasn't their wages. It was something else. The richer you are, the more likely your riches come from stocks, not salary. 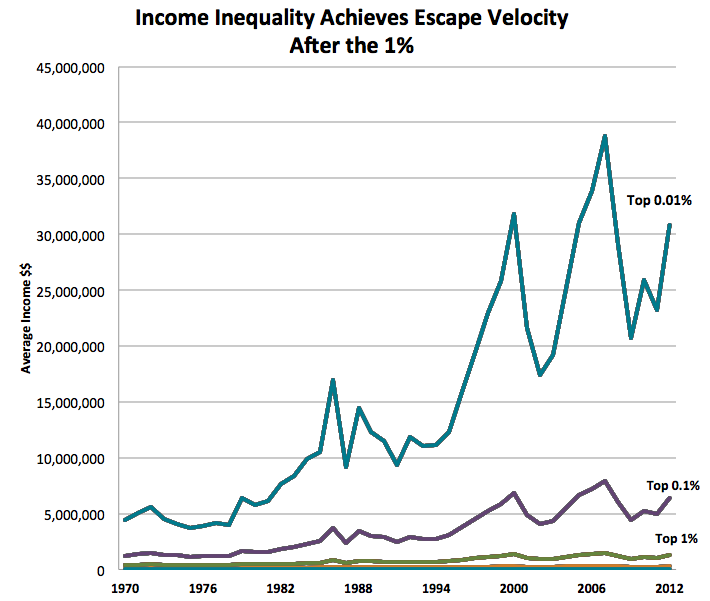 For the three groups graphed above—1 percent, 0.1 percent, and 0.01 percent—capital gains account for 22, 33 and 42 percent (respectively) of their average income. At the very tippy-top of the economy, the 400 richest tax returns analyzed by the IRS take home about 50 percent of their income from capital gains. Practically all the growth in average income at the top comes from stocks. Between 1992 and 2007, the average salary of a top-400 tax return doubled, but average capital gains haul increased 13X. Wages are for normal people. The richest get richer from their investments. As Matt O'Brien explained, the incomes of top-earners ride a roller coaster, and that roller coaster is the stock and bond market. 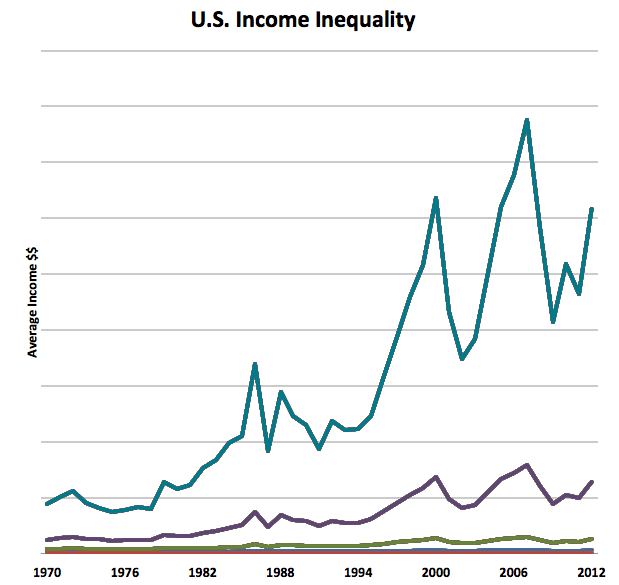 Just look at top incomes compared with gyrations in the S&P 500.